The NCAA’s Football Rules Committee is proposing a ban on Tebow’s most identifiable feature — the bible verses on his eye black. The new proposal, introduced Thursday, would ban all words, logos, numbers or other symbols on the players’ eye black, beginning in the 2010 season. The rule will not become official until it is approved by the NCAA’s Playing Rules Oversight Panel. The NCAA didn’t mention Tebow by name, but the rule was already being unofficially dubbed “The Tebow Rule” by media and fans on Friday morning. Hundreds of college football players use their eye black to boast of their hometown, home area code or love of a mother or girlfriend. But Tebow, a devout Christian, is the most prominent example of a player using his eye black as a personal billboard, having used it the past two seasons to print a bible verse and promote his faith. 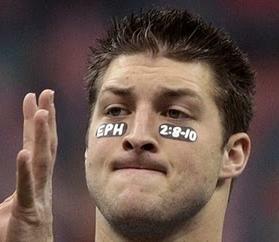 After the 2009 BCS Championship Game, 92 million people Googled “John 3:16,” the verse Tebow wore during the game. With the new rule, such a phenomenon would never have taken place. The NFL also has a “no messages on the eye black” rule, meaning if Tebow plays in the league, he no longer will be able to adorn his famous bible verses during games. Continue reading. Wow. Amazing how our freedom of religon is being taken away. 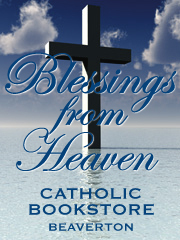 Christianity seems to be the only religion that keeps taking hits. All others have to be tolerated in the name of diversity. What’s next? An extreme cage fighter won’t be able to display Christian tattoos on his body prior beating the crap out of his opponent. Then, before you know it, you won’t be able to put “Jesus Saves” bumper stickers on Abrams battle tanks as they patrol the desert looking for people or things to blow to hell. It’s a slippery slope. (B) We should be joyful about these things, not whining – not saying that is what you are doing, but that is 99% of what I see Christians doing when faced with trials or tests to overcome for sharing our faith.